Usually we enjoy viewing momiji leaves in autumn, when their colour turns red and yellow. 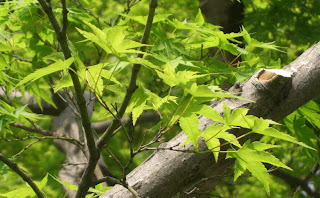 However green momiji leaves are also fresh and nice. 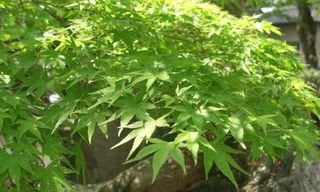 By the way, I took this picture in Jinko-in Temple, which is in the north of Kyoto City. It is not a very famous temple and is off the major sightseeing course. Actually, it is pretty cool. The small temple is well maintained and has many kind of flowers and trees. These flowers seems to open up one after another every season and delight visitors' eyes. 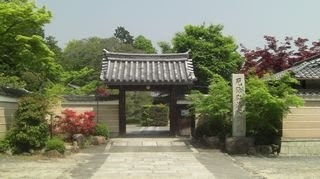 It is said the temple was founded in the 13th century (Kamakura Period). Please take #9 from Kyoto Station Bus Terminal and get off at Jinko-in Busstop.